The toilet is from Theo Klein. 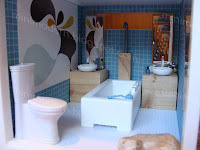 The bathtub and sinks are from the DHE's Funky Furniture Bathroom set. The vanities are standard wood blocks from hobby and craft stores. 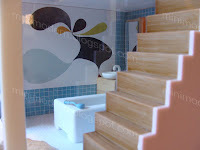 The shower base is from Plan Toys. The art is Rex Ray. All of the accessories are from Jazwares and Lil Bratz. The rock is a find while on vacation in the Carolinas...so I guess that would be--the rock is from God. 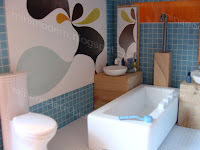 The bathroom is so lovely! "-the rock is from God." - Hilarious! Gorgeous! I love the color scheme. And, I do like to visit your blog for your blah, blah, blahs, so keep blahing! Aww, Callsmall, you're too kind. 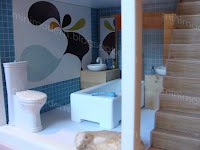 i love to read your blabla;) so now because of you ,i need another dollhouse!! my choice:ocean drive of course!! now i wish i could afford that kaleidoscope house that just popped on ebay! bleh. i do love your blahblahblah too! Very nice modern bathroom. I checked out DHE's website and they don't ship outside of the UK. How do you get their products? The DHE does ship outside the UK. The Funky Furniture and Ocean Drive dollhouse are not shipped to the U.S. I got the furniture and dollhouse from an associate who lives in the UK. You can have the items shipped to a friend who lives in a country that they will ship to and then have your friend ship to you.